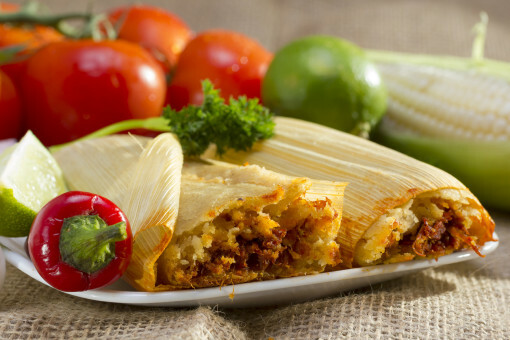 Holiday time is tamale time, and Coast Packing Company — the leading supplier of animal fat shortenings in the Western U.S. — is offering recipes for this popular dish that are sure to make a lard lover of anyone passing through the kitchen. Cook meat (pork or beef, or both in separate pots) in a large pot of water (or in a slow-cooker filled with water) with an onion, 2 garlic cloves, 1 teaspoon of chili powder, salt and pepper. Cook for the day, 4 hours minimum. The more broth you can generate from the meat, the better. After the meat is cooked (so that it falls apart and shreds easily), remove from pot, set aside to cool, and puree the onion and garlic with the broth. Season broth mixture to taste with chili powder and salt. Shred meat finely with two forks (you can even chop it after shredding), and store covered in refrigerator separately from broth. Soak corn husks in water overnight. Rinse and clean corn husks thoroughly. Drain well and pat dry. Season shredded meat with chili powder, salt, and cumin (optional) to taste. As you season the meat, add a small amount of broth to moisten meat, but it should not be runny. Assemble the tamales: spread masa about 1/8 inch thick on corn husk with fingers, leaving about ½ inch border along the sides and 2 inch border along the top and bottom of husk. Use about 2 Tbsp. of shredded meat to fill the tamale, like a cigar. Fold sides until they just overlap, fold narrow end under, and place tamale folded side down. Grandma Salazar tears thin strips of the corn husks to tie a “little belt” around each tamale to keep it secure. Although this isn’t necessary, it does look the nicest and makes each tamale a little gift to be opened. To cook, steam fresh tamales for 15 minutes or until masa is no longer sticky. Store in freezer. Steam frozen tamales for 20 minutes. (This is a real treat a few days or a few weeks later. After you’ve recovered, it’s almost like someone else made them for you). The key to good tamales is to spread the masa thinly on the husk. The more the merrier when it comes to making tamales. They are certainly labor- intensive, but oh, so rewarding. Plan two days for the project, and make sure you (or your neighbors) have enough freezer space to preserve the abundance. If you are a pro, serve tamales like my Grandma or my mom does with beef or chicken enchiladas, refried pinto beans or tostadas, and some Spanish rice. We like to mix the beef and pork for the tamales, but if you’re a purist, feel free to go with one or the other. Combine lard, salt, and baking powder and, using an electric mixer, beat at medium-high speed until well whipped, about 1 minute. Add one-fourth of the masa at a time to the lard, beating between additions until thoroughly incorporated. Add chicken stock and continue beating until dough is light and has a soft and spreadable hummus-like texture. Cover masa with plastic and refrigerate for 1 hour. Remove masa from refrigerator and re-whip, adding additional chicken stock 1 tablespoon at a time, if necessary, to return it to original hummus-like texture. Use tamale dough in any tamale recipe. Some people use a bread mixer, but my mother (and all her daughters) uses hands and muscles. Kneading the masa is great for your arms and stomach muscles. Knead your masa for 5 to 10 minutes to make sure all ingredients are blended together, until the masa is a firm ball of dough. Put the prepared masa into a plastic bag, making sure to squeeze out any excess air. Let sit for 10 minutes. Preheat the griddle or cast iron pan to cook your fresh tortillas. Set heat on medium. The griddle or pan needs to be hot to cook the tortillas properly. Remove the masa from the plastic bag and shape into medium-size balls; set them aside. The number of masa balls will vary, but usually you can make about 15. Put the remainder of the flour in a separate dish. You will use this to flour your counter and roll your masa ball. Take a masa ball and, using your fingers, knead it into a flat patty. Roll it in the flour dish and place it on your counter. Place the rolling pin in the middle of the flattened masa ball and roll outwards. Turn the masa ball over each time you roll it. This will keep the masa from sticking to your rolling surface. The tortilla should be thin when it is completely rolled out. Remove the tortilla from your rolling counter and hold it in the palm of your hand, then gently lay it on the heated griddle or pan. Watch the tortilla rise; as soon as it does, use a fork or spatula to flip the tortilla. (Make sure to adjust the heat under your griddle so the tortilla doesn’t cook too fast.) The tortilla should rise when both sides are cooked. Turn the tortilla over a couple of times to make sure it is thoroughly cooked. The tortilla should not have any raw dough; it will have brown spots from cooking on the heated pan, and should be light and airy. Remove the cooked tortilla from the heated pan and set it on a warming dish or other, to keep it soft. My mother would keep the cooked tortillas between two clean kitchen towels. Warning: If your tortilla rises while cooking, do not use your hand to squash it down. It is filled with hot steam and could cause a serious burn. It should deflate by itself. Now that you have a stack of fresh homemade tortillas, pull out the butter, or pour a bowl of fresh beans, rice or make a delicious and hot burrito. You can put anything in your tortilla and it is going to be delicious! Enjoy!